The story is far from over for The Fantastic Four and Spider-Man, but what of the Marvel Cinematic Universe? What of the incredible saga of all of those also-ran comic book films? Marvel’s contributions to the big screen by this time were comparatively few, having released only two theatrical films between 1944 and 1986 (in Captain America and Howard the Duck, respectively) and two more by the time 1990 rolled around (The Punisher and the second filmic version of Captain America). None of the recent films proved to be money-makers or critical successes (with Captain America proving to be one of the worst superhero films made to date). That said, Marvel was already ruling the television with its cartoon adaptations of many of its characters, perhaps most notably Spider-Man. Was it time for Spider-Man to make the swing to the big screen? High time! But this tangled web wouldn’t be at all easy to sort out. Episodes of the 1977 The Amazing Spider-Man TV show were released in theaters as the self-titled 1977 film, followed by the 1979 episode re-edits Spider-Man Strikes Back and Spider-Man: The Dragon's Challenge. While B-Movie Maestro Roger Corman (the genius behind New World Pictures, who did create the Incredible Hulk TV movies, the Power Pack pilot, the Punisher flick and the Generation X attempt) was itching to make his own version of Spider-Man, his option to the character expired in 1985, thus allowing Marvel to sell the rights to Cannon Films, a division of Golan-Globus, the gang of idiots who reached for Oscar Gold, but came back looking like fools. Am I being unfair to Cannon? Let its filmography speak for itself. During its less-than-20-years as a “thing”, Cannon produced such fare as Operation Thunderbolt, Cheerleaders Beach Party (both 1978), New Year’s Evil (1980), Death Wish II (1982), Hercules (1983), Revenge of the Ninja (also 1983), Breakin' 2: Electric Boogaloo (1984), Missing in Action 2: The Beginning (1985), The Delta Force (1986) and Masters of the Universe (1987) to name a few. So what if it had its mandibles set on Spidey? What could Cannon have done with an ambitious Superhero film? Does the title Superman IV: The Quest for Peace (1987) mean anything to you? Yes, that, too, was a Cannon production, meant to “save” the Superman franchise from the debacle that was Superman III (1983). By comparison to Superman IV, Superman III was practically Richard III! Why? Cannon had already found itself in financial trouble due to its horrible business practices (if you want to read more on Cannon, don’t miss my articles “From the Zombie Hordes to the Successfully Bankrupt: The First Year of 'The Next Reel'” and “Out of Sequence: The Saga of Hollywood's Hidden Sequels”). What do I mean? The aforementioned Superman IV found its budget halved to help pay for the aforementioned Masters of the Universe with Cannon absolutely sure that both would be enormous hits. Neither were, and Cannon hit the skids in a big way, thus preventing the making of its proposed Spider-Man. How bad could Spider-Man have possibly been under the watchful eyes of experienced producers Menahem Golan and his cousin Yoram Globus? Well, it would only have been the worst “superhero” movie ever made, bar none, considering the fact that neither of these slow-pokes had a clue one about what the character was all about. This could be forgivable, if the two stooges hadn't filled in their self-chosen blanks with their own ideas. You see, Golan and Globus believed, for all the world, that Spider-Man was something like… the Wolf Man. I wish I was joking, but I am not. Thus, they hired The Outer Limits creator Leslie Stevens to write a screen story concerning Peter Parker, a hairy, suicidal monster with eight arms who exists as something of a human tarantula thanks to his bombardment with radiation. Yes, folks, that was the Spider-Man movie that almost got made in the '80s. Further treatments (pushed for by Stan Lee himself) related to both Spider-Man and Doctor Octopus being mutated by the same experiment (with both characters claiming to be “Spider-Man” and neither opting for the name “Doc Ock”). During this incarnation, Tom Cruise was considered for the role of the web slinger with Bob Hoskins under consideration for the villain. Along the way the budget was slashed from $20 million to $10 (in the wake of Superman’s grounding and his quest falling to pieces). Ultimately Cannon sunk like the stone that it was and Golan (who should never have had his tentacles on the property) took Spider-Man with him to 21st Century Film Corporation and finally Carolco Pictures, where the already world-shaking James Cameron was brought on to write and direct. Cameron produced a scriptment (which was largely the work of the previous writers with a new name and date on the story) but Golan balked at Cameron’s unprecedented creative control, complained and sued (with 20th Century Fox joining the fray, claiming the Terminator creator owed the studio a follow-up to True Lies). The litigation continued until 21st Century, Carolco and, yes, even Marvel Comics all went bankrupt. Marvel was rescued by a merger with toy manufacturer Toy Biz, the remains of Carolco reemerged as part of C2 Pictures and Golan and Globus (whose name certainly sounds like it should be that of a Spider-Man villain) continued to produce movies that you don’t want to see. At the time of this writing both Yoram Globus and Menahem Golan are still alive and at large. If you see them armed with a camera of any kind, for heaven’s sake, take the damned thing away from these men before they turn you into a giant tarantula. In the meantime, MGM/ UA acquired all of 21st Century’s film library and assets (including the drafts and screenplays for Spider-Man) thanks to a quitclaim by Carolco. However, Marvel was still gold-hungry as it emerged from bankruptcy and the courts ruled that Golan and Globus’ licensing agreement for Spider-Man on film had expired (the original contract stipulated that the film must be at least started by April of 1990 or the rights returned to Marvel). 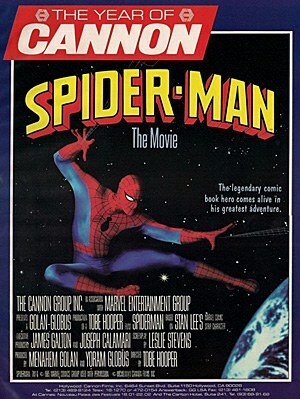 Thus, the comic book company quickly sold the web slinger’s rights to Columbia Pictures (which had released the 1977 episode re-edit), a division of Sony, as of 1999. As a side-note, I did establish how bad a Spider-Man under Cannon might have been, by comparing it to Superman IV: The Quest for Peace. Could the possible Spider-Man under the 21st Century Film Corporation been any better? Probably not. Remember the aforementioned 1990 version of Captain America? It was produced by Menahem Golan for 21st Century Film Corporation. In short, thank goodness for the rights being granted to Sony. Still, MGM/UA claimed possession of the scripts that had been written up to that point and, thus, thought it had some claim on a Spider-Man film. At the time, that studio’s only guaranteed cash cow was the James Bond series, and it was hungry for the wall-crawler to line its wallets with green webbing. However, Sony, via Columbia, had something that MGM/UA also feared, and it wasn’t the Green Goblin. Two major James Bond films had been made outside of the umbrella of the James Bond series we all know and love. The first was Columbia’s Casino Royale (a spoof of the franchise) and the second was Warner Bros.’ Never Say Never Again, a remake (or, at least, second version) of Thunderball, which was controlled by its co-creator Kevin McClory. McClory had approached Columbia with the possibility of a second remake of Thunderball, while Quentin Tarantino approached the same studio with his ideas for a Casino Royale remake. Either possibility promised to be detrimental (or, at least, damaging) to MGM/UA’s own Bond saga. So to the courts both studios went. Finally, Sony got Spider-Man and MGM got the rights to the only James Bond property it hadn’t yet touched, Casino Royale (Tarantino had already moved on to make Jackie Brown in 1997). And while webbing Spider-Man was a big boon for Sony, MGM didn’t just get the rights to make Casino Royale, it got the rights to both existing versions of Casino Royale too, as well as the rights to Never Say Never Again and any possible competitive properties that the now-late McClory once controlled. Thus, the tangled web woven for Spider-Man finally unspooled on the big screen in 2002’s appropriately titled Spider-Man as directed by The Evil Dead’s Sam Raimi (who most assuredly “gets” both the action and wise-cracking comedy of the character) and starring Tobey Maguire as old web-head himself. While the film did retain a few of the elements of the previous drafts of the screenplay, the closest thing to a grotesque mutation that Peter Parker went through was the development of natural web glands (as opposed to the comics’ web shooters). No eight legs here. Spider-Man was followed by the excellent Spider-Man 2 in 2004, which did introduce Doctor Octopus (Alfred Molina) and proved to be another enormous hit for Sony Pictures. It was followed by Spider-Man 3 in 2007 which was both the biggest financial success of the trilogy and the worst reviewed film out of the three. Luckily, they did lay the groundwork for the upcoming sequel Spider-Man 4 by introducing the character who would one day morph into The Lizard.